who have enjoyed my playing for weddings and private parties. "Just a short note to say 'thank you' for the wonderful music that you played during the ceremony and drinks reception at Leighton Hall. Thank you for your help in making it a fantastic day!" “Thank you so much for entertaining us and our guests with your wonderful music! "In July, I attended the wedding of an old a friend in the Lake District. I normally attend these functions with a sense of some trepidation. The speeches are usually dire and the music for the reception often has the unique property of being able to sour milk. Imagine my delight when the speeches turned out to be entertaining. However, even more surprising was the quality of the music - supplied by one Peter Brown. The temptation to abandon the celebrations and stand by the piano was almost overwhelming. I assure you if any other friends or associates plan on getting married within 100 miles of your base (which at my age is unlikely), I would not hesitate in recommending your service. I just wanted to say thank you so much for playing on our wedding day at Muncaster Castle in May. It was absolutely beautiful and everything was perfect. I would recommend you to anyone who wants a pianist." Thank you so much for playing for us on our big day. You provided the perfect accompaniment for the ceremony and the reception. There have been many comments and complements about 'the pianist' in our wedding chats with people. We are very grateful that you travelled so far and charged us so reasonably." "Thank you so much for the music you provided during our wedding and cocktail reception in August. We really appreciated all your help and hard work to make sure everything was in place (and in tune) for our big day. And the music was so wonderful! Your calm, serene and kind manner really added to the celebrations." "Just wanted to say a massive thank you for last Saturday! I loved your playing and really loved the songs you did with my friend Victoria ;-) Sounded amazing. "Just wanted to say a big 'thank you' for making our day so special. Truly, a memorable day!!" "Apologies for taking so long to write to you, we just wanted to say a sincere thank you for playing at our drinks reception. You played beautifully and we thought that you were fantastic!! 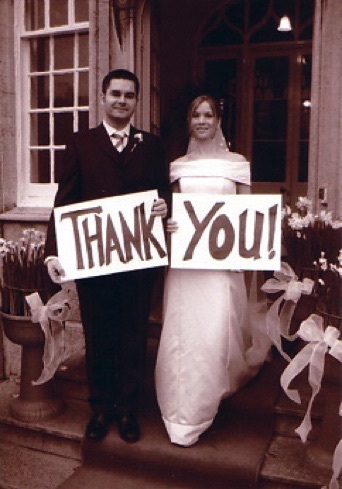 "We just wanted to say a big thank you from the bottom of hearts for playing at our wedding, it made the wedding breakfast extra special, and our guests commented on how wonderful it was. Along with lots of songs everybody knew, a superb standard, and great professionalism it was one of the highlights of our day."